Measuring the flow quantity of gases and liquids is a common industrial processing task. There are numerous technologies available for measuring fluid flow, each with its own set of advantages and drawbacks for any particular application. Some of the technologies and methods have been in use for a very long time, with recent enhancements provided by electronics or smart sensor designs. Ultrasonic flow measurement devices employ a comparatively recent technology to measure gaseous or liquid flow. Whether the transit time differential or Doppler method is utilized, ultrasonic flow meters have a distinctive characteristic in that they can be deployed in a form factor that does not require insertion into the fluid. A common installation method is to clamp the ultrasonic transducer assembly onto the exterior of a pipe. This makes the technology attractive for applications that involve adding a flow measurement point to an existing piping system. 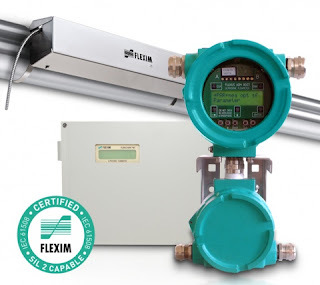 Flexim, a globally recognized leader in ultrasonic flow measurement, offers a number of permanent and portable units for measuring liquid and gaseous flow rates. Some of their instruments have been certified as SIL 2 capable, along with a host of other third party certifications. The product range includes simple and accurate instruments designed for general industrial use, and extends to multi-beam units intended for applications, such as custody transfer of fluids, that require the highest accuracy and overall performance levels. Share your flow measurement challenges and requirements with instrumentation specialists, combining your own process knowledge and experience with their product application expertise to develop effective solutions.